Posted by Erik Asarian on Monday, August 6th, 2012 at 2:19pm. Nobody rings a bell at the bottom...or do they? Given that there were only 58 new NOD's in the ENTIRE COUNTY in April, May, and June, don't expect a sudden surge in the number of foreclosures in the next couple of months. 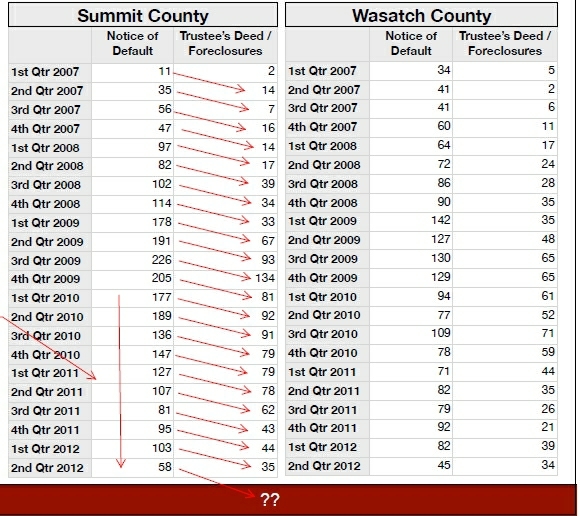 There just isn't much shadow inventory of distress sellers left in Deer Valley and Park City at this point. As inventory levels continue to drop across most Park City neighborhoods, we predict you'll have fewer properties to choose from, and you may have to pay more than the last guy did as prices begin to rise in the coming months. So for those of you waiting for confirmation that the Deer Valley and Park City real estate markets have stabilized, can you hear the sound of the bell ringing?